I can use the back-end but I can't see the front-end. So I can post content, but I can't see it. Good times! I don't think it was deliberate. There's been all these attempts to lock everything down, it's shocking we can even check the weather these days. Have I taught you all nothing?! Carry a blowtorch. Problem solved. GO Train Schedules Displayed for Highway Commuters? So... how's that going? When I received this submission for publication, I reached out to the Ministry of Transportation for Ontario for comment. So far, a week later, crickets. For all I know, my email was filed under "G", for garbage. Another burgeoning boondoggle for Burlington? For a few moments, let’s set aside the engineering embarrassment that is Burlington GO station (and its parking garage).and look at Metrolinx’s latest experiment for that city. I’m sure you recall the provincial government’s announcement on October 14, 2016 of “a year-long pilot that will use electronic highway signs to show drivers nearby transit information and promote alternative travel options, to help manage congestion and get people where they're going sooner”. Is it safe to assume Eleanor is making her way from her constituency into Toronto? If so, why is Eleanor heading westbound? If Eleanor is in lane two, she better hope there isn’t an eighteen wheeler or other large commercial vehicle to her right, because she won’t see that sign. In order to make that GO train in “12 minutes”, does Eleanor believe there is a reserved parking spot for her close to the platform? Has Eleanor paid for a reserved parking spot at a GO station? If she hasn’t, she’ll be hiking in from the “back forty” of the parking lot. Does Eleanor think she’ll get a seat on the train? If she does, what if it’s in the Quiet Zone? Neither the Ontario government, nor Inside Halton bothered to provide locations for the signs. 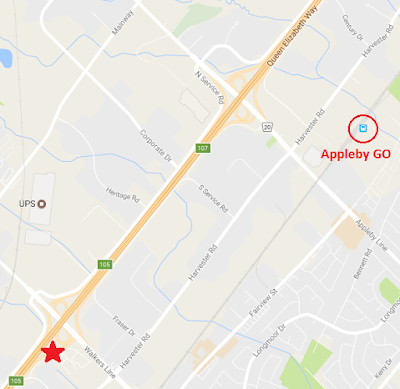 The best they could do is state “near Appleby GO station”. WTF does that mean? The QEW interchange before Appleby Line (Toronto bound) is Walkers Line. The star on the map identifies the vicinity of a sign matching the description given in the news article. Play the video as many times as you want; there’s NOTHING displayed on that sign. Is this the correct sign? Perhaps readers of This Crazy Train can provide the exact location of any working sign along the QEW with GO train information. Given that we’re four months into a one year pilot project, I’d like to know where these signs are, so I can provide meaningful feedback to Eleanor and Metrolinx (as I’m sure we’d all like to). It's like a black hole, isn't it? 1. Be sure to check the Presto website, particularly if your trip is delayed. I tapped on at Union around 4:15. When we finally arrived at Unionville, around 7:45, I dutifully tapped off. The usual fare (with Presto) for these two stations is $7.28. To be fair: GO has refunded me the full $25.40; I was expecting them to refund only the amount I was overcharged. It took a call to start the investigation (where the rep told me I could submit this request on their website...which is not what their social media team told me), and a follow-up email as the first credit was short. I get that these types of incidents are beyond GO’s control, but perhaps a better protocol could be put in place (maybe announcement by CSAs to not tap-off and call customer service for proper adjustment). After logging-in, the bottom part of the home screen (under the heading “My PRESTO Card Activity”) shows my last 5 transactions. The pulldown menus default to ALL (for Agency) and February 2017 (for Date). If I change the Date menu to “All 3 months”, I see 5 transactions from December 2016…and nothing from 2017. Please feel free to share this info with your readership if you deem it worthy. PS: But please keep my name/email to yourself. Huge failing on the CSA to not advise you all not to tap. And of course, there's no communication between presto and GO. It's absolute crap. So much of it is manually done. Zero automation. Burlington GO Station passengers: We want to give you another update on the work happening at your Burlington GO Station: Work is progressing on the exterior of the station building, bus loop and canopy. The building roof is being prepared for the cladding and solar panels. We've posted the latest information here. You can also see the notices found at the station. We know that construction is taking longer than expected and we will continue working with the contractor to ensure the work is done to our standards. We'll also continue to update you on our progress in future emails and notices posted at the station. Thank you for your continued patience as we work to improve your Burlington GO Station. Presto tracking a privacy issue? https://t.co/7JZIEcmfaa This says our identities needed for CRA purposes yet our names are not on report? If you thought the TTC was expensive now, brace yourselves! Have you had problems parking at the Burlington GO station lately? Metrolinx says parking spaces are a premium at the station lately because of a boost in ridership. Still, for several days this winter, the top floor of the station's parking garage has remained empty — because the ramp leading up to it can't withstand poor winter weather conditions. I have choo choos and choo choo accessories. Can you imagine running for a train and you fall into this? Oooh that's a scary headline in this morning's Metro. Now replace that with GO Transit passengers at risk for exposure to cigarette smoke. That's a goddamn horror film right there. But it doesn't sell papers I'm afraid. I'm not downplaying the study or its findings, but at any given GO Station across the GTHA, we are all still subjected to second-hand smoke as we walk past PRESTO machines, wait for buses or walk in and out of a station. At Oshawa, there's even a designated smoking area on the platform, complete with official green signs. Hey, if you can't beat them, might as well make them happy, right? Pardon me for not running out onto Front Street screaming, BURN IT ALL DOWN! 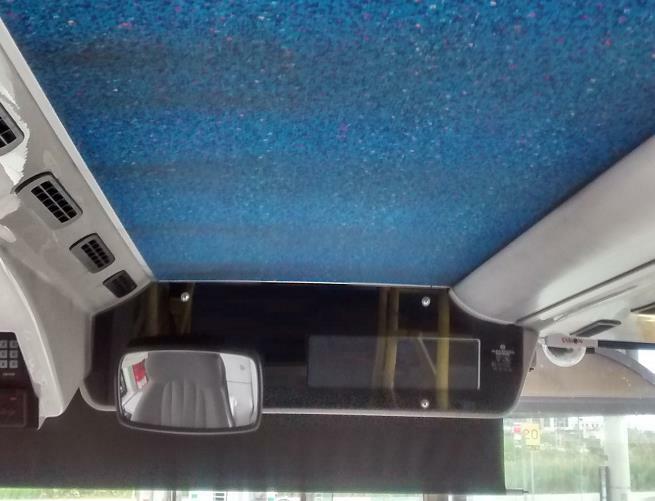 after reading this article since I'm personally fed up with the lack of attention the soot issue on GO Transit Double Decker buses is getting. My man on the street, aka GO Voyageur, has been at this for well over a year trying to get answers from Metrolinx about the mysterious substance that blows through the HVAC systems of these buses and stains the walls and ceiling. Something tells me it's even more sinister than diesel dust. Wait, maybe it is diesel dust!? But back to this GO train diesel dust issue, it would be interesting to know what the readings would be for the first coach behind the locomotive on a VIA train, which doesn't push? 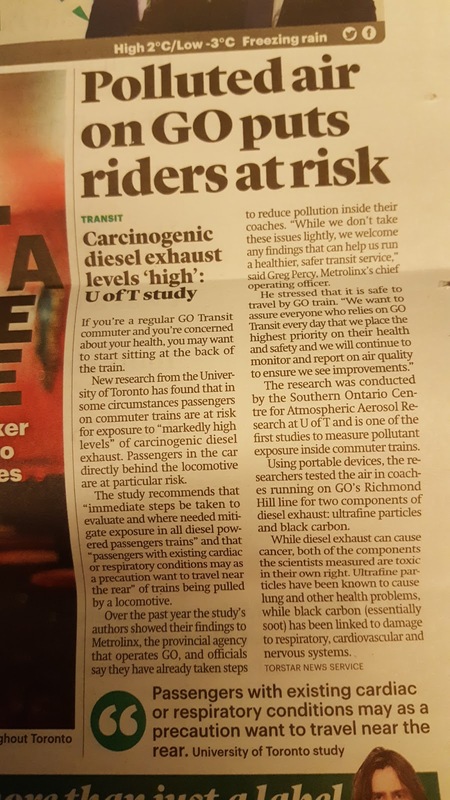 “A recent study led by Dr. Greg Evans from the University of Toronto found that some GO train cars contained elevated levels of diesel exhaust emissions when they were being pulled by the locomotive. The study looked specifically at the presence of black carbon and ultrafine particulate, which were found to be the highest in the car directly behind the locomotive. Because the health and safety of our customers and staff is our top priority, we worked with Dr. Evans’ research team throughout the study to help gather and analyze data. Since evidence is still emerging on the effects of these particles and this study is the first of its kind for commuter trains in Canada, we are conducting further tests in partnership with SNC Lavalin and the University of Toronto to better understand the issue. The study notes the diesel locomotives tested are similar to those used by other public transit agencies in cities such as Vancouver, Chicago, San Francisco, Washington D.C., Boston, Los Angeles, and Seattle, so we’re hopeful this work will result in improvements that can be applied throughout the industry. It also notes that this is not an issue for trains that are being pushed by the locomotive from behind, which accounts for roughly half of our trips. We’re already addressing all of the recommendations made in the report, which include installing improved air ventilation filters, using Tier 4 diesel locomotives with the highest emissions standards, and pursuing electrified service. After installing and testing new high-efficiency filters on select trains, we’ve found that they significantly improve onboard air quality. While further testing is needed, we are on track to have the new filters on all train cars by the end of March to ensure we see immediate improvements. We’re also already using Tier 4 diesel locomotives, which are the most emissions-friendly on the market. Our entire UP Express fleet is powered by the Tier 4 locomotive—the first rail service to use it in North America—and we have one Tier 4 GO locomotive running with another 16 on order for 2017-18. Going forward, any new diesel locomotives we add to our fleet will be Tier 4. We’re also moving forward with plans to electrify large sections of our rail network, meaning we’ll carry many passengers in vehicles that have no diesel emissions at all. We don’t take these issues lightly, and we welcome any findings that can help us run a healthier, safer transit service. As Dr. Evans points out, the study is not meant to discourage customers from using GO trains. He has been commuting on GO trains for years, and so have I—15 years, to be exact, and I will continue to do so. 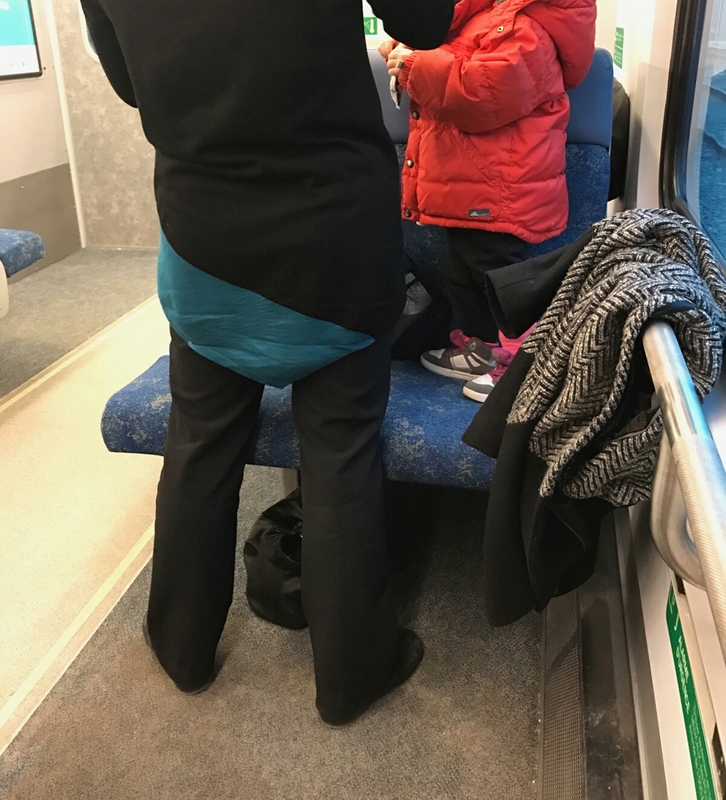 We want to assure everyone who relies on GO Transit every day that we place the highest priority on their health and safety and we will continue to monitor and report on air quality to ensure we see improvements." ... Seriously, tho, why not just leave a few minutes earlier? According to the Financial Post, when asked how the average GO commuter might view proposals to hand generous pay hikes to executives at some of Ontario’s bigger corporations – including an extra $8 million for the already lavishly-compensated bosses at Ontario Power Generation – Liz Sandals, Treasury Board president in Premier Kathleen Wynne’s Ontario government, offered a brusque put-down. “Most of the people sitting on the GO train probably don’t have high-level nuclear qualifications or the business qualifications to run a multi-billion-dollar corporation,” she remarked. The Financial Post has more on this. She apologized but her apology is not accepted. Sandals isn't on Twitter. I was firing with all fingers Friday night. What a stupid thing to say. We're coming for you, Liz. And it won't be pretty. Good luck in the next election. Youtube video for those who want it. Ah, the UK. It shouldn't even be a debate! Two women get on. One woman exclaims, "These seats are so dirty!" Both sit down opposite each other. Both proceed to put their boots on the cushions of the seats in front of them. I counted to three, got up, walked over and said, "Now you know why the seats are so dirty." Are people really this clueless? We shouldn't have to debate the lack of class displayed by other passengers. We all pay to ride. We all have a right to say something to these asshats. The CRUD continues! 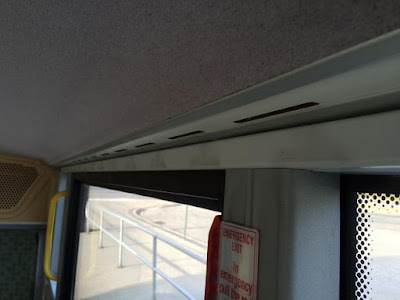 Part 9 of an installment, exclusive to This Crazy Train, of "Meet the Deckers"
HOLY EXHAUST STAINS ON A CARPETED CEILING OF A GO BUS, ARE WE REALLY AT CHAPTER NINE WITH THIS? Editor's note: If you have had issues while aboard a Double Decker bus, or have a story about a Double Decker experience, drop me a line at cj@thiscrazytrain.com. A recent Twitter post by @nickromyn reminded me I owed CJ an article. My apologies for being tardy. In this installment, I continue my story to illustrate to Anonymous that “putting it on the internet” IS the norm now; writing directly to GO Transit can be a long laborious effort in futility. Note that my use of the term crud is a colloquialism rather than the acronym for Chalk River Unidentified Deposits, although some may be want to draw parallels. Thank you for your response of July 28 regarding the black matter being pumped into GO Transit double decker buses. Greg Percy and Cindy Smith were not copied, but I have included them on the distribution list for this e-mail. On November 11, 2015, you wrote "We are working with the manufacturer to solve the problem as quickly as possible." In your current e-mail you write "Since March, we have been changing these cabin filters and cleaning the ceilings." Are you saying for over a quarter of a year nothing was done to address the problem? How can that be considered "as quickly as possible"? 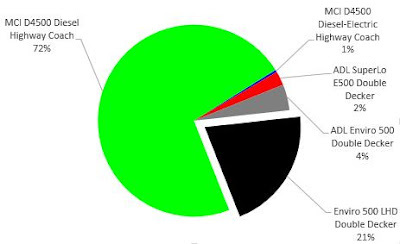 I'm trying to understand the context of your reference to "less than 20% of the fleet". If we look at the fleet as presented in the July 2016 version of GO Transit's Bus Fact Sheet, the Enviro 500 LHD Double Decker buses come close to what you cited. 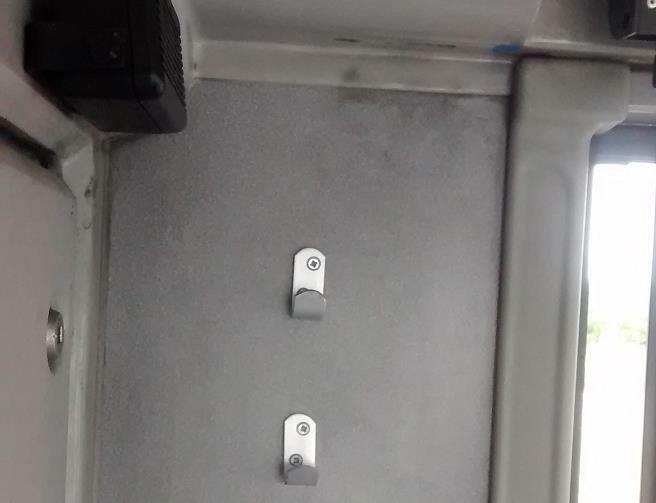 In fact, these buses — numbered 8101 to 8205 — are the ones exhibiting the black crud. I believe we can agree that 100% of these Alexander Dennis Ltd. double decker buses have defective HVAC systems. As for testing the used cabin filters, why wasn't that done when I brought this matter to your attention last year? With respect to the overall cleanliness of your buses, I have not noticed the improvement you promised in November 2015. I'm still not sure what you meant by "brought up to our standards". Please pardon my cynicism, but based on the evidence in the field and Metrolinx's track record for on time delivery (Burlington GO station, real-time bus info, ADL SuperLo DDs on the road), I don't see how the remediation efforts are "to be finished by the end of August" (this year?). Here are this week's collected photos of dirty deckers. In the aftermath of the train scheduling debacle, Mr. Percy stated, "As chief operating officer, I take personal responsibility and am committed to a full investigation," Who is taking "personal responsibility" for this on-GOing mess on your buses? Please accept my apologies for the delay in my reply. 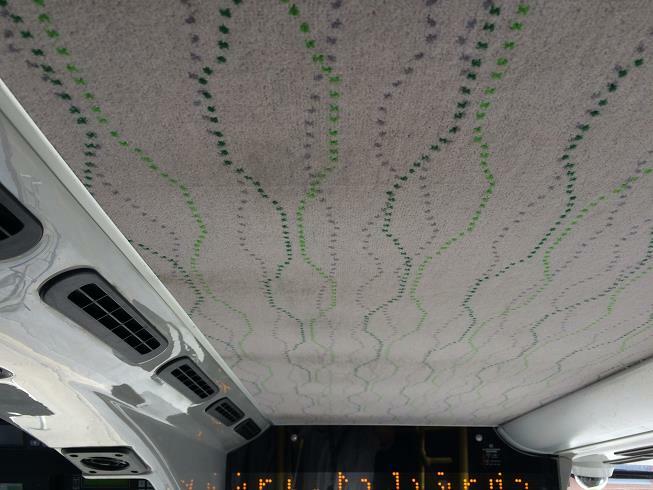 I have looked into the results of the investigation of the Indoor Air Quality report conducted on our GO buses. The results concluded that no unusual particulate materials were identified and the composition of the dust samples was similar to that observed in typical household or office settings. The staining was much more visible on the lighter colored ceilings. Dust accumulations around supply air vents are not uncommon, however, the stains that you have observed appear to be more visible given the colour of the ceilings. In light of this, we will pay closer attention to the build-up that occurs around the air vents and ensure that that these areas are thoroughly cleaned. I would like to assure you that we continue to remain committed to ensuring our buses are maintained to the highest standard. Hammer the Presto Card Facebook page with your concerns and complaints! Interesting stuff that's being posted. Be sure to add your input. Use this direct link if you're having trouble with the embedded picture below. And it doesn't even take into account how many people just don't bother filing a service guarantee claim. I forget - a lot. I think I filed three in 2016. Another thing I'm bad at is calling into Presto when the readers fail on the bus and I can't tap off. I'm charged for the whole bus trip to wherever it terminates. I think I spent close to $60 due to Presto card reader failures in 2016. So maybe, the Presto windfall due to reader failure cancels out the expense of service guarantees! Brilliant! Anyone else feel that Metrolinx just doesn't have its house in order? It can't just be me. Presto is a nightmare. Presto sure has its failures ... just yesterday notices finally went up on Facebook and Twitter informing cardholders that the self-load machines are experiencing technical difficulties. And since I have your attention, there's something else I'd like to point out. I get that Presto is frustrating, but those frustrations don't warrant harassment of Metrolinx spokespeople and the social media teams for Presto and Go Transit. You can voice an opinion (all the accounts are monitored and trust me when I say that people that matter do read the tweets and Facebook comments). I voice opinions all the time. What you shouldn't do is attack, berate and insult the people behind these accounts. It's not cool. In fact, when you are deliberately mean, no one will want to listen to you. And I don't care that these people are paid to represent the organization, they are not paid to be told to "eff off and die" and be subjected to verbal abuse. The article also states: Factors that GO considers outside its control include police investigations, trespassing incidents, pedestrian collisions, and extreme weather. I was interviewed for the article and I pointed out my on-going concern about a factor that does warrant a refund - engine failure. GO Transit doesn't have a solid plan for what to do when a train breaks down. Check out this story from 2013 and this past September's hostage-taking. History just repeats itself. Not having a plan proves to be very costly since September's breakdown resulted in all of us on the train being reimbursed $100 each. Hopefully, this tremendous figure of $4 million warrants a solution.